Giving things away free to people who need them but can’t possibly afford them seems, on the face of it, to be a totally reasonable thing to do. We rate generosity, philanthropy – it’s the right thing to do. However, there are consequences, often negative consequences, of giving things away for free. The first consequence is that you destroy the market, where a market exists, for the product you are giving away free. This will have serious consequences for those earning a livelihood in those markets. I remember, when I worked in the Dominican Republic trying to improve the incomes of small dairy farmers, the frustration we felt as yet another ship load of milk powder arrived as a ‘gift’ from the EEC (as the EU was called then). These shipments completely undermined the local market for fresh milk and destroyed the livelihoods of the small farmers working hard to try and earn a living. On a recent trip to Zambia, we tried to buy some of the locally made textiles we liked so much when we lived there 20 years ago. The textiles factory is closed – hundreds of jobs gone, a whole industry destroyed. Why? Because of the bales of donated clothes coming in from the west. In Lusaka markets, you can even buy cast off ski-wear. Where no market exists, giving things away free removes any incentive for a market to be created and this can stifle development. 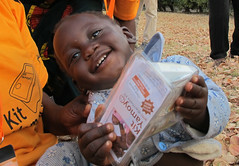 The ColaLife Business Model is about creating a market for a new public health product – an anti-diarrhoea kit or ADK. Part of our work is to see if we can establish a demand for this product and ensure that local wholesalers and retailers can make money fulfilling this demand. If we can do this, the prize is huge – we mobilise the existing private sector to distribute ADKs. We don’t need our own distribution system and the enormous costs associated with that – 40% of the cost of a medicine in these areas can be transport. In addition, we put money into the pockets of some of the poorest business people on the planet, and get an essential public health product to those who need it. The next step would be to base as much of the manufacture, sourcing and packing as possible locally. This is all very well, but what about the people who cannot afford to pay for the an ADK no matter how much it costs? Do you just shrug your shoulders and say: “Well, we can’t help everyone? Off you go to the clinic – it’s 20 km that way.” No, of course you don’t. It would be totally unjust to do so with an commodity that relates to a basic human right. But what you don’t do is give away the product for which you are trying to create a market. What we are going to test in the ColaLife Trial (details to follow shortly) is the use of vouchers. Mothers and care-givers will be given vouchers as part of the social marketing activity and they will be able exchange these vouchers at retail kiosks for an ADK. The retailer will then redeem this voucher using his or her mobile phone. So, the mother will get the ADK at no cost to her limited purse, and can choose to buy one when she needs it, rather than taking that 20 km walk. The retailer will get their reward for bringing the ADK to the remote rural community. But there are losers doing things the ColaLife way. Can anyone spot who they are? Sorry Simon missed years of colalife. But I thought the key thing was that Coke Cola was the distribution network. Not any more? What’s all this reliance on retailers mobile phones? Great to hear from you. The reason people are excited about piggy backing on the Coca-Cola distribution system is because the product gets virtually everywhere. Others, including the public sector, are able to do distribution to ‘district’ centres but what’s special about Coca-Cola is their ability to get their product right into the remote communities. It’s the ‘last mile’ that is the really valuable part for us. Given that this is the situation we, working with our partners in Zambia, needed to decide the best place to feed the ADKs into the system. We’ve decided to do this at ‘district’ (wholesale) level. One of our partners – Medical Stores Limited (an independent body of the Ministry of Health) – already receives drugs and other supplies into the country, stores them and does a pretty good job of getting them to the ‘district’ level. In the trial, they are going to procure the ADK components, store and assemble the ADKs and get them to the wholesalers at ‘district’ level. It’s at the wholesale level where the ADKs will be put into the crates and from there we will be invoking the same motivations to get the ADKs to communities that Coca-Cola use to get Coke there – the profit motive. To pump prime the demand for ADKs in the remote communities and to ensure that even those who can’t afford to buy one can still get one we will be giving vouchers to mothers. These vouchers will be redeemed by the retailers using a mobile phone. Voucher redemption would have been very complicated and long-winded before mobile phones. In this way, the profit motive is preserved but everybody gets an ADK who needs one. In addition, mothers who have their own SIM (or phone) will be able to authenticate the ADK by sending an SMS with the unique ADK code. This will give us good monitoring data and be reassuring for the mother. We plan to reward authentication with an eVoucher (on their SIM) giving 50% off their next purchase. Of course, we don’t know how well this is all going to work and that’s why we are working hard to raise the money to do the trial. There is, if anything, even more excitement in the international development community now about the impact of mobile communications – and particularly e-health by SMS, stock tracking, anti-counterfeiting and so on – than there is about the potential of the ubiquitous Coke. 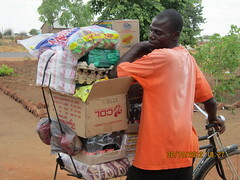 Some great recent research at audiencescapes.org – click on the Zambia link.